20654, vintage blue Indigo Beni M'Guild Moroccan rug, Berber blue Moroccan rug. 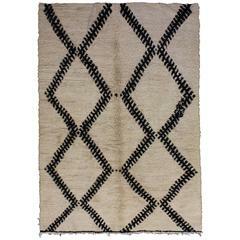 Featuring rich waves of abrash, luxury underfoot and a pop of color, this hand-knotted wool vintage Moroccan indigo Beni Mguild rug represents modern style while staying true to the authentic spirit of Berber Tribe culture. 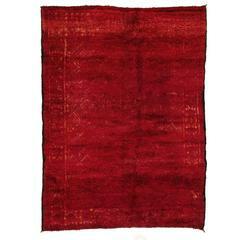 Part of the appeal for many people is the high pile and Primitive charm found in these Moroccan rugs. With its plush texture and vibrant color, this solid blue Moroccan rug will add a hint of energy to nearly any room. Rendered in variegated shades of blue, indigo, royal blue, cobalt blue. Well-suited for a wide range of interior styles: Abstract, Nomadic, Boho Chic, Abstract Expressionism, Cubism, Modern, Mid-Century Modern, Contemporary, Post-Modern, Memphis Group, Industrial, Rustic, Lodge, Contemporary Scandinavian, Ethnic, Primitive, African, Tribal and Bohemian. Perfect for adding a pop of color to a living room, family room, game room, play room, bedroom, study, studio, office, sitting room, children's, nursery, man cave, theater room, hallway, entry, foyer and entryway. Abrash. Hand-knotted wool. Made in Morocco. Indigo Beni M'Guild. Berber tribes of Morocco. Measures: 06'05 x 10'06. Exceptional vintage tribal Moroccan rug, with neon accents, handmade in Morocco. Approximate dimensions: 300 cm x 150 cm. Rare size semi antique tribal rug from the moroccan mountains. 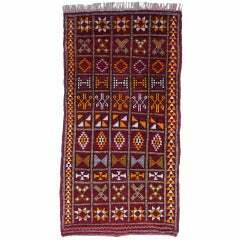 Made by women of the Zemmour tribe, handknotted from high quality wool. 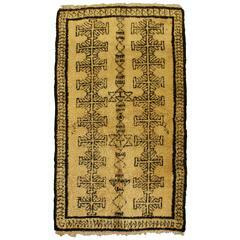 Amazing antique Beni M'Guild rug from the mid-20th century. A real collector's piece in excellent condition, with embroidery and details in silk. Rich, luxurious and handmade.